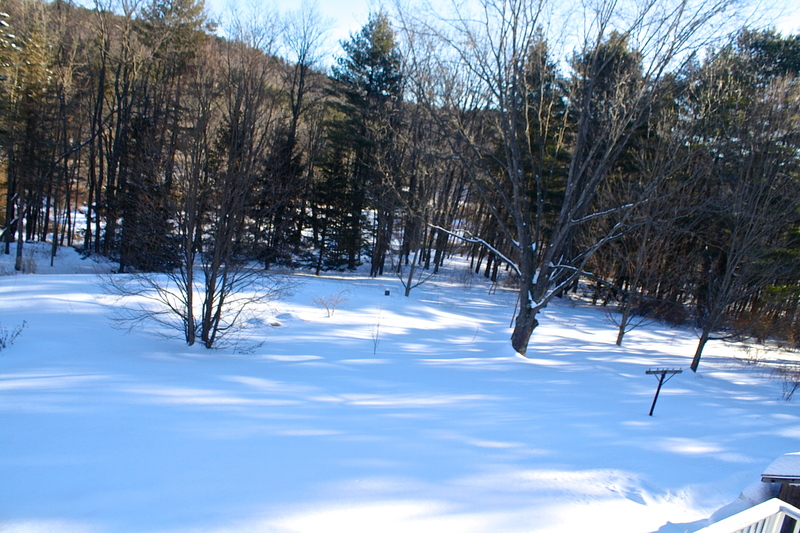 And my back yard looks like this, beautiful with early morning shadows, with about two feet of snow (so far – it ain’t over yet – generally speaking, we get most of our snow in February and March). 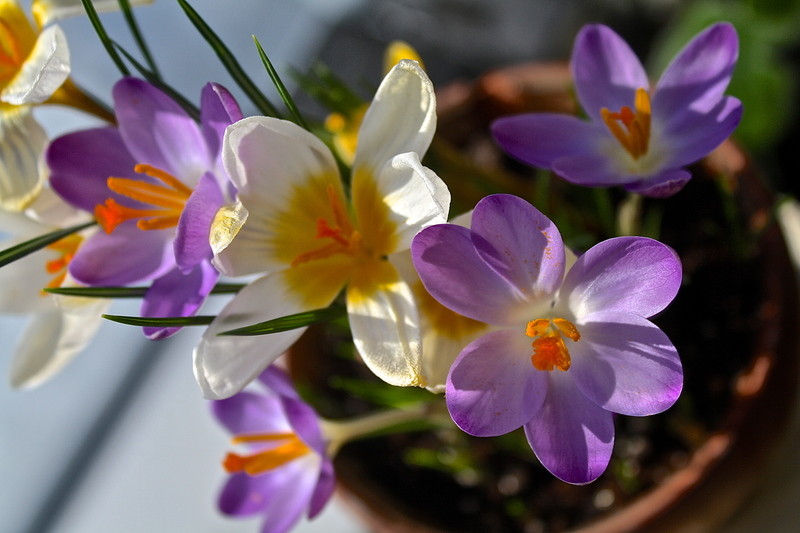 Forcing bulbs is such a wonderful way to bring Spring into my life a little earlier, cheering my winter-weary soul. 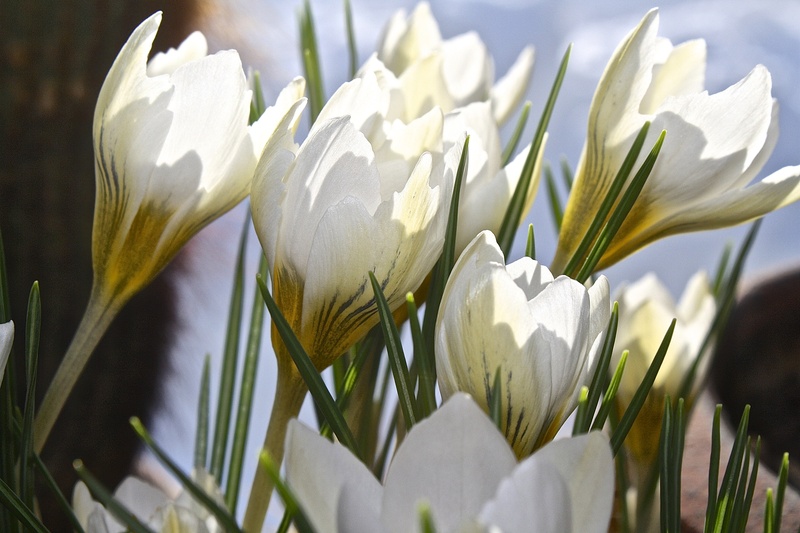 These little crocuses, which exude the most heavenly fragrance, tell me to hang in there, soon enough the season will change! 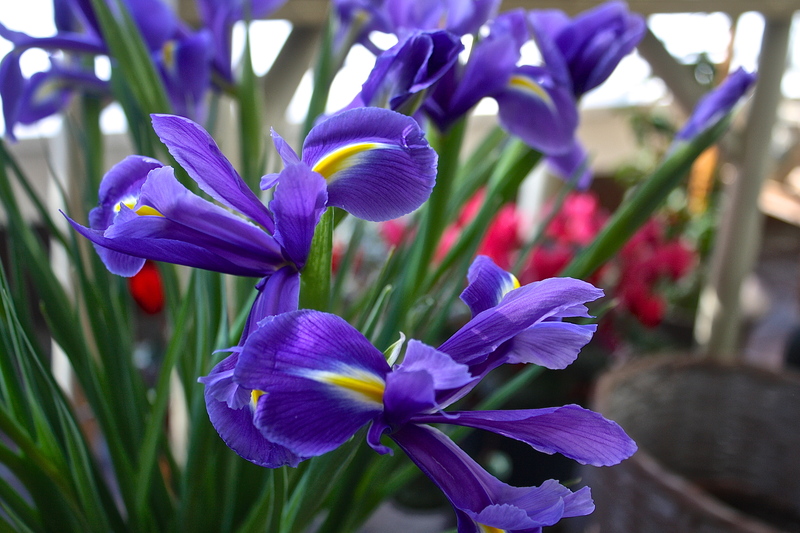 My sweet husband bought me a bouquet of Dutch iris that I’ve kept in the cool sunspace to make them last longer. Normally they last about three days in the warmth of the house, but here they’ve lasted a week and a half. 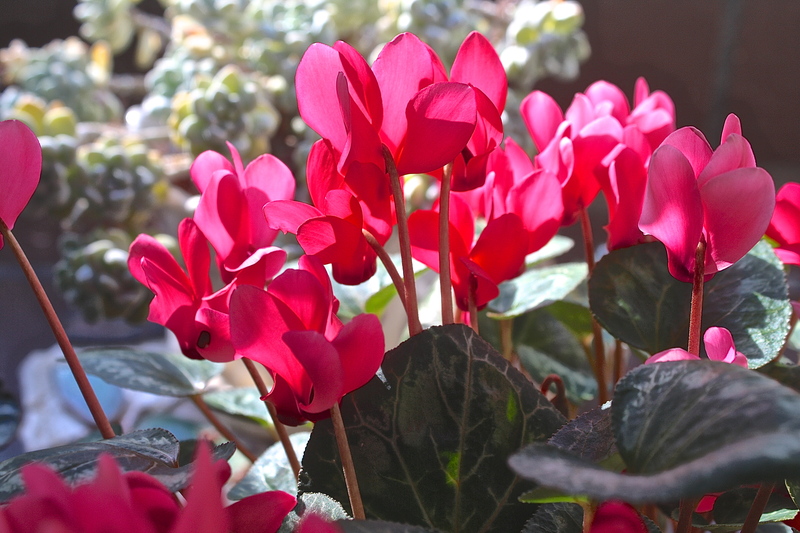 Another winter favorite of mine are cyclamen. This lipstick-pink variety is so prolific, on sunny days it perfumes the whole room. (I think it smells like Bazooka bubblegum!) 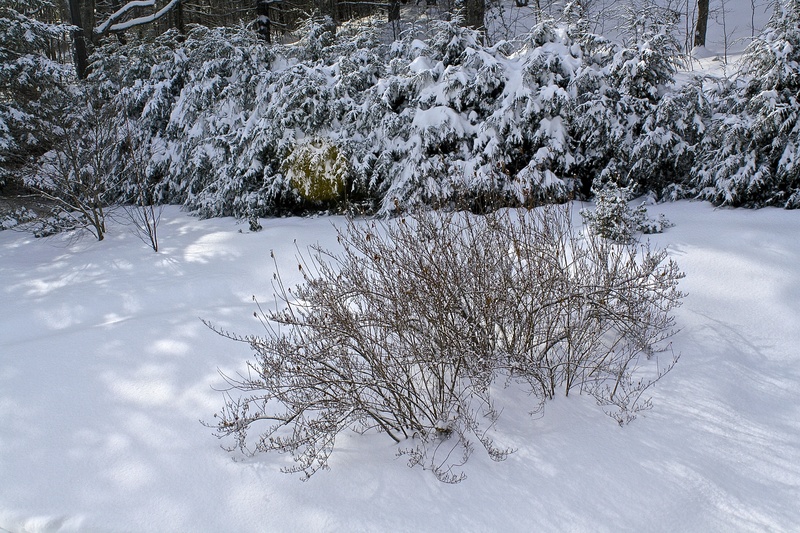 They love cool weather and go dormant in the spring when it gets warm. I stop watering them, tuck the pots into a dark corner of the porch and forget about them until leaves begin to emerge in the late fall, when I start watering them again. They prefer to be pot bound and I’ve had this one for at least a dozen years and only transplanted it once. So even though the spring equinox is still about four weeks away, today I get to enjoy the preview of coming attractions. Image | This entry was posted in Country Gardening, My Photos and tagged crocus, cyclamen, Dutch iris, Emily Dickinson, flowers, forcing bulbs, fragrance, greenhouse, indoor gardening, landscape, snow, spring, sunspace, winter. Bookmark the permalink. always such joy and love of life expressed in your words/images. What a blessing. Thank you, Kim! I do feel blessed. I like these posts, I think you have a stunning variety. Oh too beautiful!!!!! I did not see the beauty till I scrolled down + it was like WOW…those are just beautiful pictures of some amazing flowers. Well, I do like your snow shots, but I am so tired of the white stuff. We had another 5 inches on Sunday + more to come again. Mother nature is teasing us since it got up to 49 degrees today! Yeah right, and in a few days back down again…I need flowers, so it was so nice to stop by and see all your beauty! What talent you have to force all those bulbs. Mine are all under snow-lol!You are smart to force bulbs!!! Thank you, Robbie, you flatter me with your praise. It really doesn’t take a lot of talent to throw a few bulbs in a pot and stick it in the garage, but yes, a little forethought to do it is in order. I know how they brighten my long winter days so the little effort in October really pays off come February! Oh these are fantastic, Eliza. Your yard looks wonderful and I love that you force bulbs indoors!! What a treat, especially this year. I’ve always thought about doing that but never seemed to get around to it. African violets do well in my wide-southern exposure home…..but even those finally faded out last year. You’ve inspired me to rethink a window garden for next year. Thanks, Sharon. With the grocery stores now carrying inexpensive flowering plants, everyone can have the joy these little gems bring. Likewise, I always try to have cut flowers around the house as well. It makes such a difference – a mood-lifter! Buy some next time you’re out! I share your view of winter, I really haven’t minded it so far. I keep thinking, “At least it keeps the ticks dormant!” We have a really big problem with Lyme disease here, so on that level, I’m not in a real hurry for spring to come. Oh my – both worlds are so beautiful!